Champions Network of Young Professionals will be hosting it’s second annual mini sticks hockey tournament this Thursday at 99 Sudbury. This is one-of-a-kind charity event bringing together teams of young professionals from various business sectors to compete in an evening of friendly competition while raising money for Right To Play. 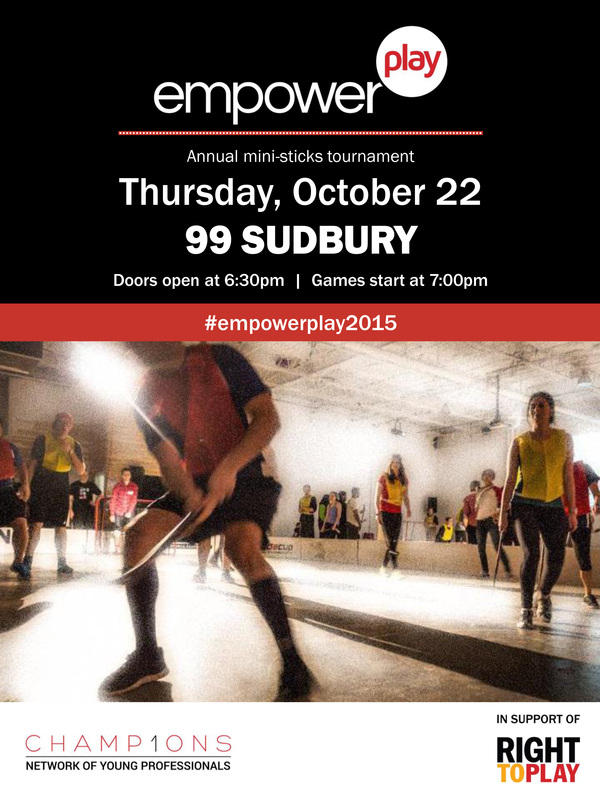 Empower Play will host teams in a mini-sticks hockey tournament and attract over 150 spectators. Last year CNYP launched its inaugural Empower Play event which helped us raise $24,000 in net donations. This enabled 400 children & youth around the world to participate in sport & play activities every week for 1 year.